Planet nine may be hiding at the edge of the Solar System, in the cold, dark recesses of our family of planets. Now, new research, together with evolving technology, suggests we may be nearing the time when we find this elusive world. Trans-Neptunian Objects (TNO’s) are bodies beyond the orbit of the most-distant known planet. Observations of the movements of these objects hints at the presence of a currently-unknown body orbiting well beyond the orbit of Neptune. “In addition to a host of readily-predictable orbital behavior, the emerging census of trans-Neptunian objects displays dynamical phenomena that cannot be accounted for by interactions with the known eight-planet solar system alone,” researchers stated in the journal Physics Reports. Fred Adams, Professor of Physics and Astronomy at the University of Michigan, believes that as new advanced tools come online within 10 to 15 years, astronomers will have either discovered a ninth planet, or have collected enough data to rule out the possibility of such a world. Thousands of planets surrounding other stars have been discovered in recent years, as telescopes and observational techniques become more refined. Predicted properties of a ninth planet suggest such a world should now be visible, if we knew exactly where to look. However, there is a lot of sky to examine, making the search extremely challenging. One strange object found orbiting Neptune, 2015 BP519 (nicknamed Caju), lends credence to the idea that a massive super-Earth may be hiding in the cold, dark depths of our solar system. Its strange orbit suggests its path is influenced by the presence of an unknown Planet X. Other TNO’s, including the dwarf planet Sedna, also show evidence that such a super-Earth exists, so far unseen, at the edge of our family of planets. “The strongest argument in favor of Planet Nine is that independent lines of evidence can all be explained by a proposed new planet with the same properties. In other words, there are multiple reasons to believe that Planet Nine is real, not just one,” Adams said. 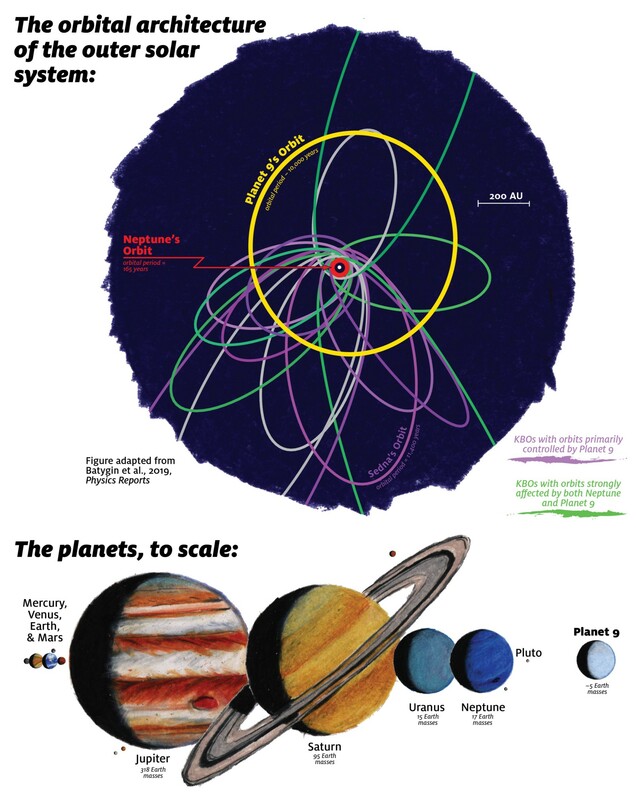 When the idea of a ninth planet was first suggested in detail in 2016, calculations showed the world was likely 10 times larger than Earth, orbiting the Sun 600 times further away from the Sun than our home world (600 astronomical units, or AU’s). New research from the University of Michigan suggests the world is smaller and closer than previously believed — just five times larger than the Earth, orbiting at a distance of 400 AU’s. This is still more than 10 times further away than Pluto, which once held the title of the ninth planet. 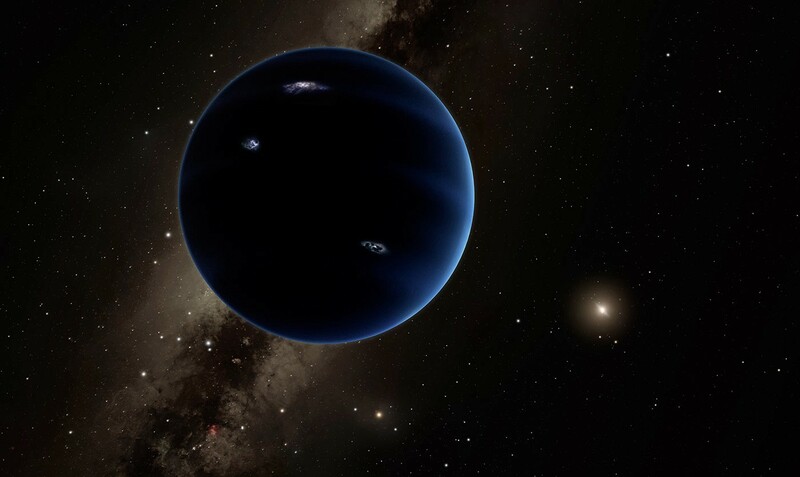 The discovery of a Planet X beyond the orbit of Neptune would explain several mysteries about the movements and positions of TNO’s scattered around the solar system. If new telescopes are unable to find such a world in the next 10–15 years, then astronomers will need to find another way to account for odd behavior happening out beyond the known planets of our Solar System.